Wieliczka Salt Mine is the World’s only mining site that has been operational for over 8 centuries. 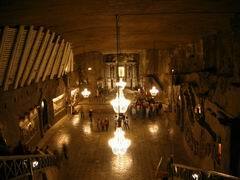 Since 1978 Wieliczka Salt Mine stands proud on the UNESCO World Heritage Sites list. Some describe it as Wieliczka having the same WOW factor as Terracotta Warriors at Xian or even the Gran Canyon. A photographers paradise and salt-admirer must-see. Be sure to lick the walls – we are not kidding. We provide the best quality service and we know how to get you there stress-free at best times to visit. We recommend 8:00am – 16:00pm to make the trip manageable. Our English speaking driver will pick you up from the hotel or any given address and he will take you to Wieliczka. The fee is 9each per person. An English guided tour takes about 2-2,5h walk. We will book for you tickets in advance. After visiting Salt Mine our driver will take you back to Krakow. Prices are in Euro (€) / Polish Zloty (PLN) per person. We arrange pick up time between 9.30 a.m. and 10,00 a.m. Our English speaking driver will pick you up from the hotel or any given address and he will take you to Wieliczka where will be waiting for you an English guide. The ride with our English-speaking driver lasts for about 40min each way. The sightseeing of the Salt Mine with an English-speaking guide takes about 2,5h. After the tour we will drop you off at your hotel or wherever you wish to in Krakow. Price in Euro (€) / Polish Zloty (PLN) per person. If you’d have any other question or suggestion regarding your trip to Salt Mine please feel free to contact us. tour you want to take and whether it’s combined or singular.